The area around Guildford is mostly made of chalk grasslands, which are just looking marvellous at this time of the year. 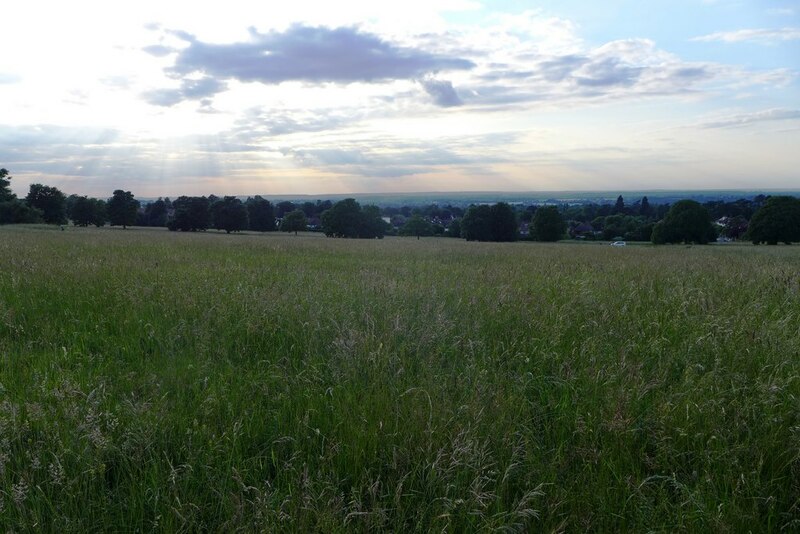 Here are some pictures of a quick walk I did in a small reserve overlooking Guildford, Merrow Downs which is also home to Guildford Golf Club. 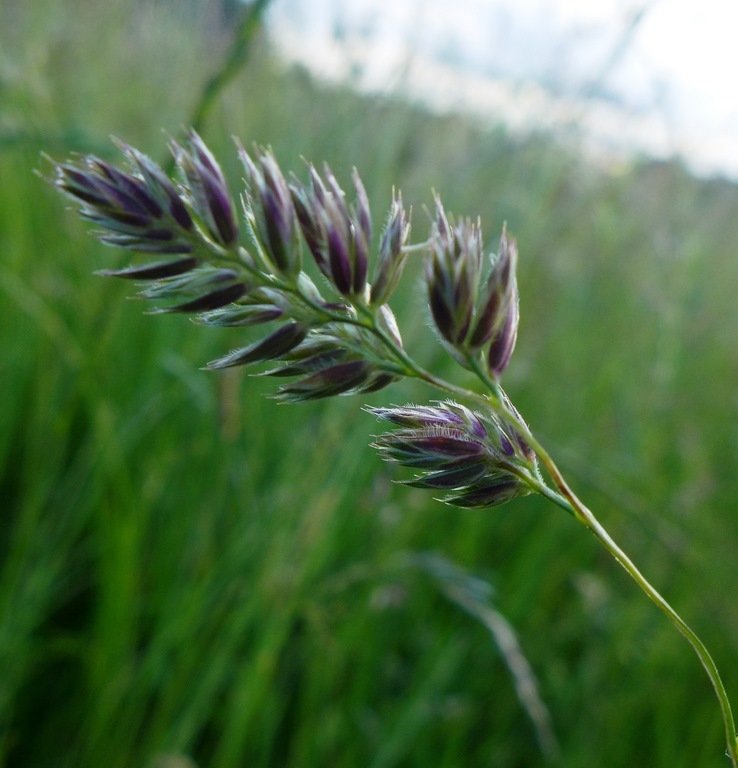 As the name states, this is above all a grassland, so let’s have a look at the grasses. Most people see grasses as boring, greenish herbs giving hayfever…but they can actually be pretty coloured and interesting! 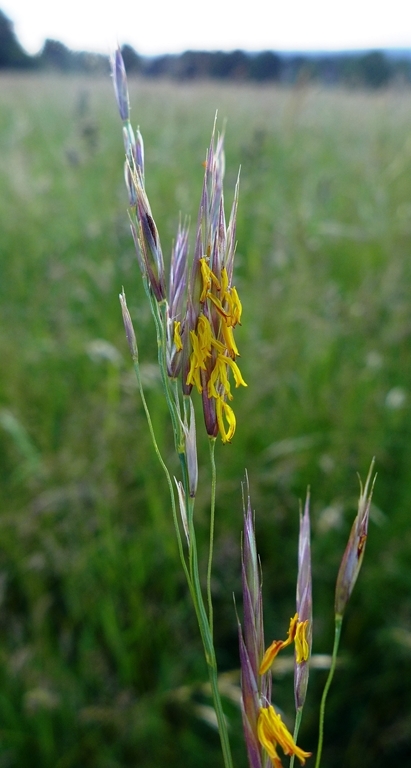 The stamens are often bright to attract pollinators : yellow for Avenula pubescens (Downy Oat-grass), purplish for Poa pratensis (Smooth Meadow-grass). 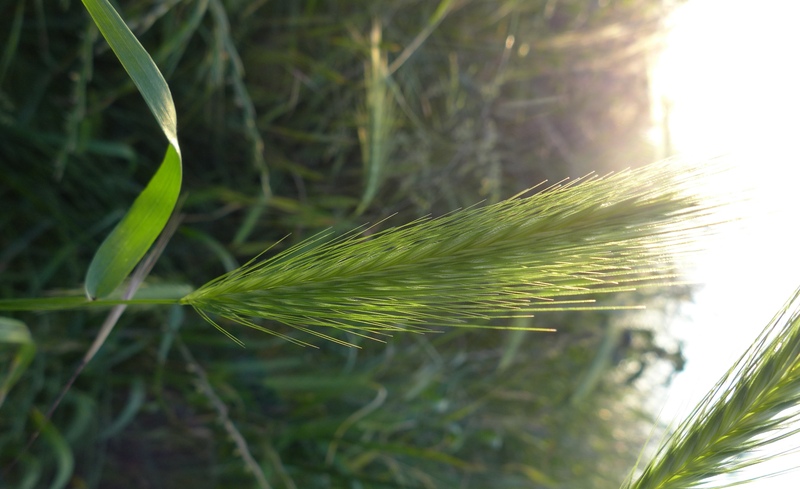 Grasses are notoriously difficult to identify, but these ones should make you happy! 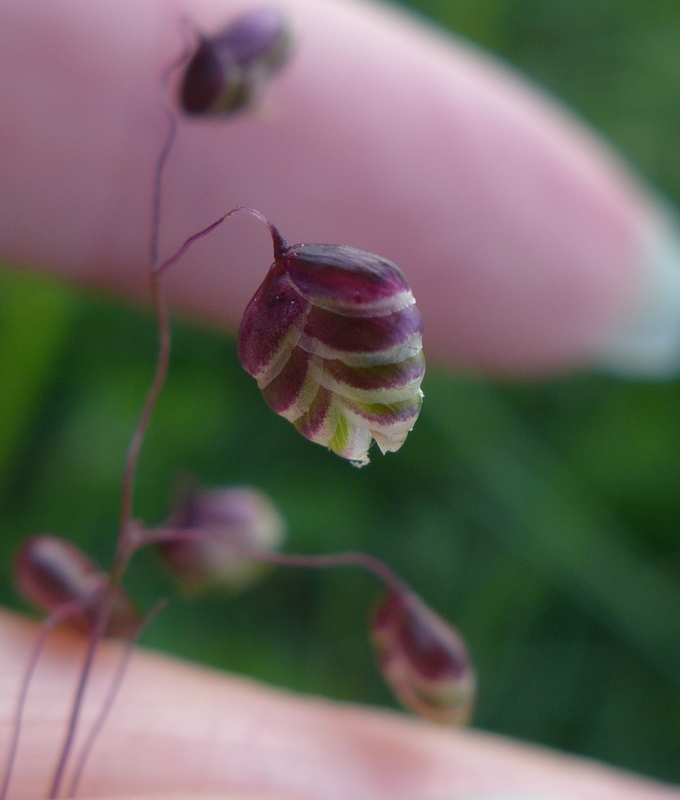 Briza media or Quaking Grass (my favourite!) has little heart-shaped spikes dangling in the wind (in French we call it “amourette”, meaning “love affair”). By contrast the tall bristly spikes of the Wall Barley (Hordeum murinum) are a common sight in waste ground (these typical bristles are called awns). Grasses can take all sorts of shapes : Timothy-grass (Phleum pratense) has tall stems, with dense “bottlebrush”-like spikes; while the Barren Brome (Bromus sterilis) bears long, drooping and slightly sad-looking inflorescences. Now that we’ve seen some of the most distinctive grasses, I’m afraid I have to move to the mass of dull looking, difficult ones…the Tall Oat Grass (Arrhenatherum elatius), the Yellow Oat-grass (Trisetum flavescens, a common species which can be toxic to grazing animals) and finally the Perennial Ryegrass (Lolium perenne). 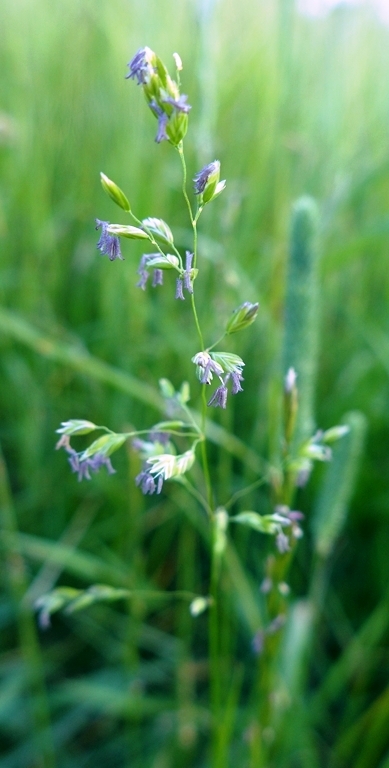 The latter is often used as a turf species, for example on Wimbledon tennis courts! 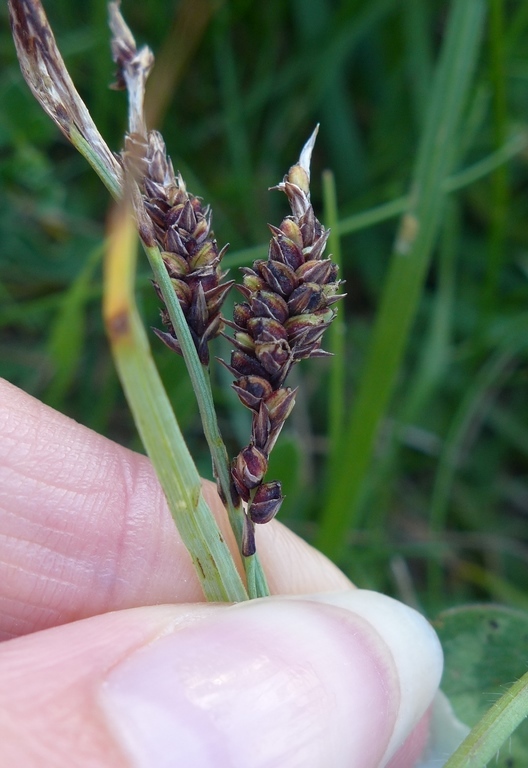 These two might share a similar purple colour, but the first one, Cocksfoot (Dactylis glomerata) is a true grass whereas the second one is a sedge (Carex flacca or Glaucous Sedge). 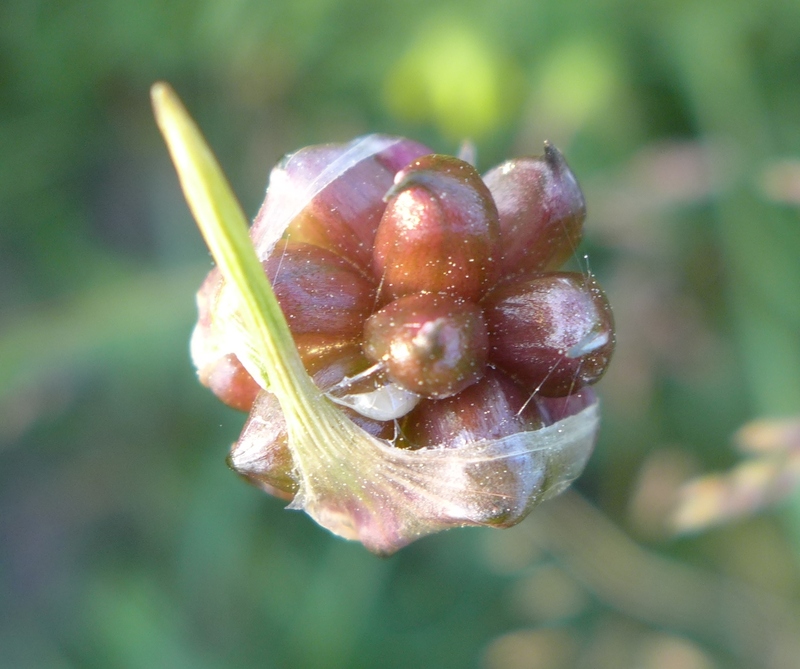 Many sedges have unisexual spikes (entirely female or entirely male) : in this one the two lower, purplish spikes bear pistils (female organs) while the two upper and slender spikes in the top left-hand corner bear stamens (male organs). 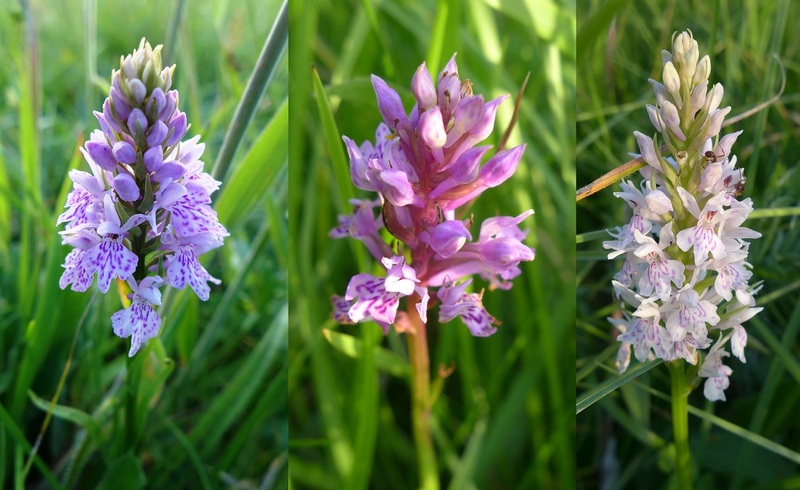 Of course chalk grasslands are famous for their orchids, and at this time of the year, Common Spotted-orchid (Dactylorhiza fuchsii) are abundant. There is a fair amount of variation in shape and colour in this grassland, as you can see! 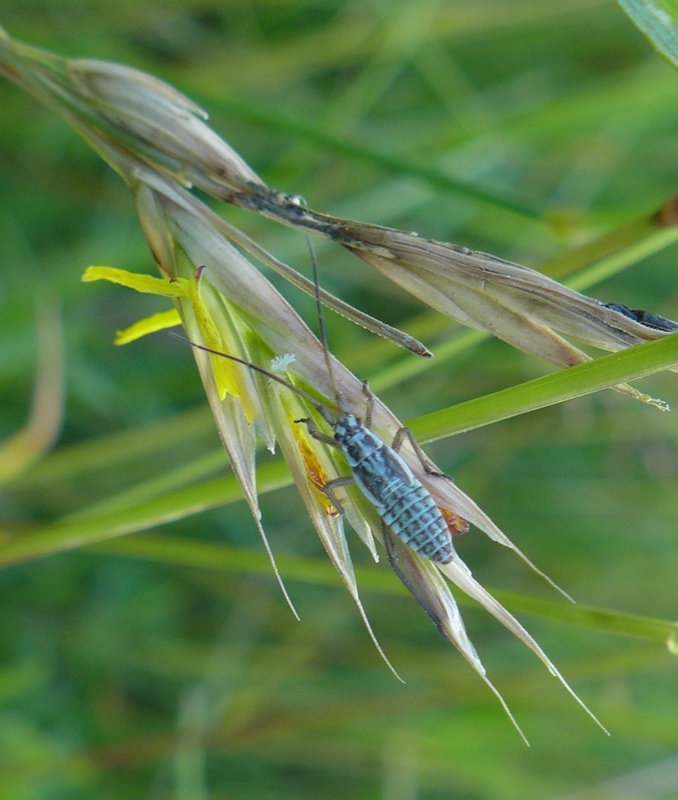 Insects love these flower-rich grasslands, and at this time of the year, both adults and larvae can be seen. 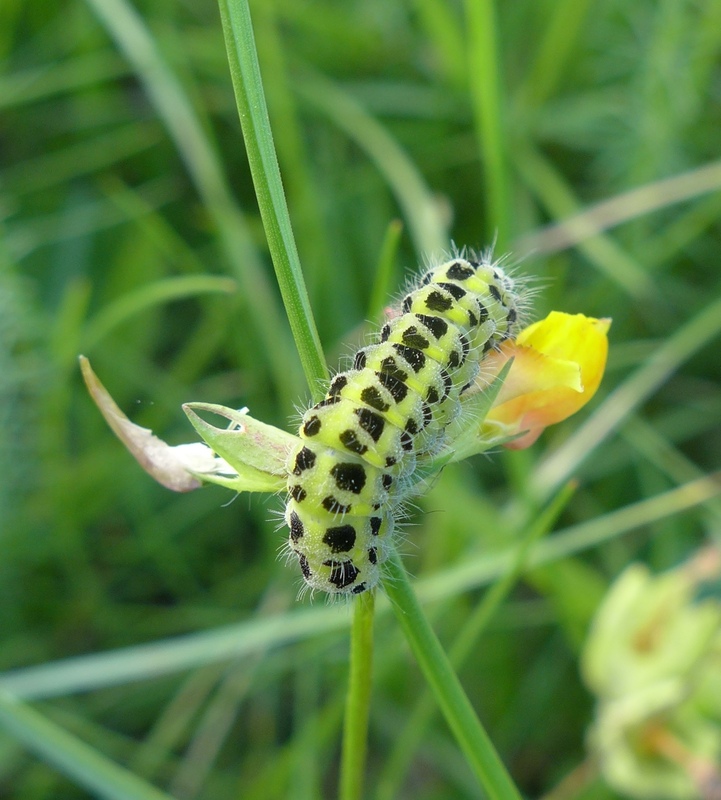 Butterflies and moths are particularly abundant…Here, I spotted a yellow caterpillar, which belongs to the Five-Spot Burnet moth (if you want to see what a Burnet Moth adult looks like, check my post from last year : Chalky Guildford), on its feeding plant (Bird’s Foot Trefoil, Lotus sp.) 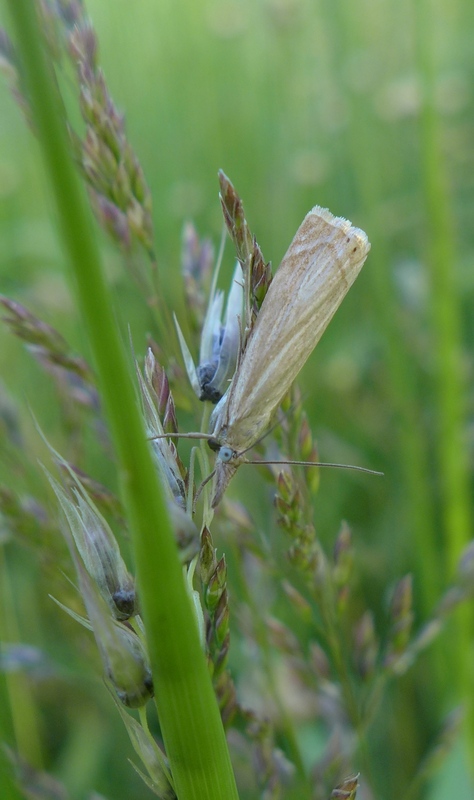 and a cool looking moth (Chrysoteuchia culmella, with its little “snout”). Beetles are everywhere…left is a garden chafer (Phyllopertha horticola) which does look very much like a cockchafer minus ridges on the wings. 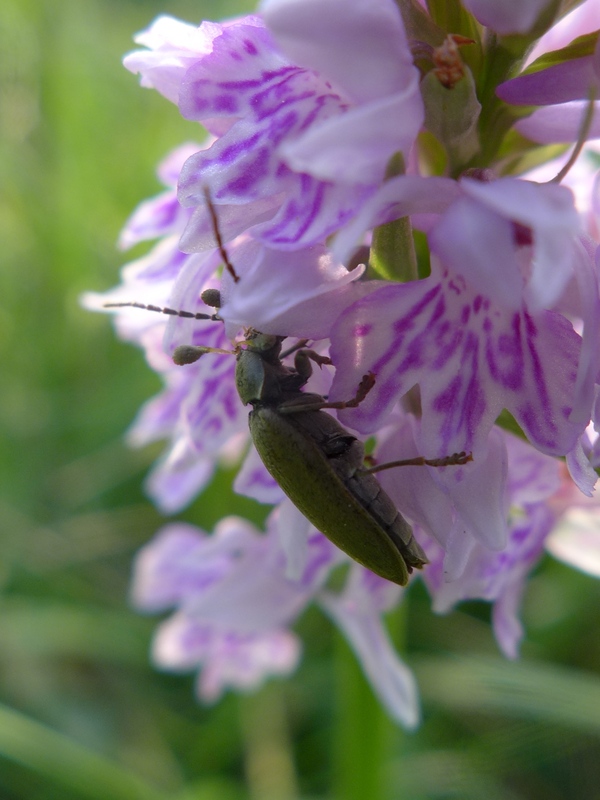 Right picture shows an interesting beetle, Dascillus cervinus or the Orchid Beetle. If you look closely, you can see two brown “blobs” protruding from its head….these are in fact orchid pollinia (sticky pollen masses which are carried from one flower to the other by the insect!). Many insects use camouflage colours (browns, greens..) to escape predators , but some beetles have an ever more bizarre mechanism. 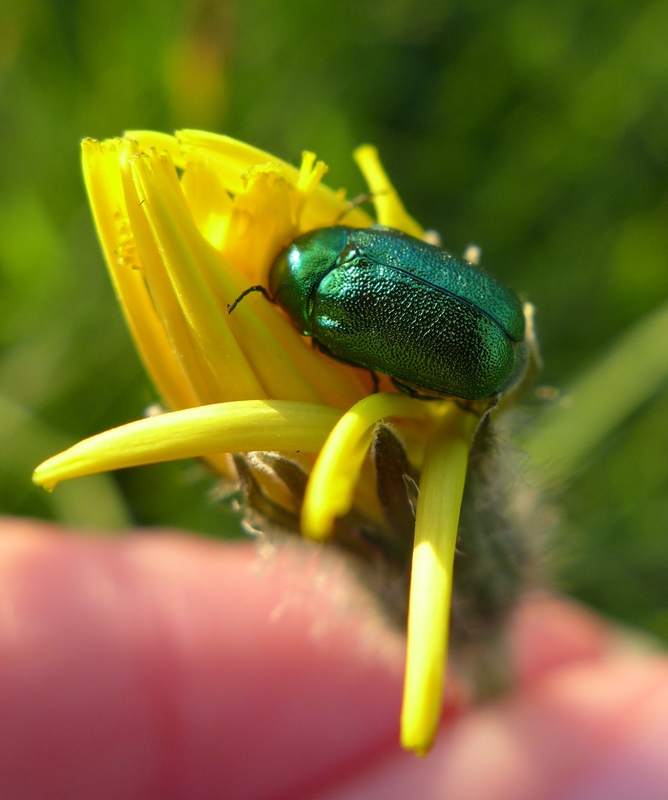 Metallic beetles like this Cryptocephalus are thought to “blind” potential predators when sunlight reflects on their wings. Cryptocephalus (meaning “hidden head” in greek) are easy to recognize because their tiny head is hidden under their chunky body. The other picture shows a bug nymph (Miridae probably). You can see this is still a larva as the wings have not reached their full, adult size yet. Obviously chalk grassland hold much more than grasses and orchids, and among some of the other interesting plants to be spotted are this wild garlic (Allium sp, probably vineale – the tiny blobs are flower buds waiting to open) and the Goat’s-beard (Tragopogon pratensis) which does look exactly like a dandelion (but the seed head is bigger and creamy-white) so you can’t really miss it! which are home to other plants like the Wild Mignonette (Reseda lutea), a plant of Mediterranean origin whose roots have been used for centuries to produce a yellow dye. 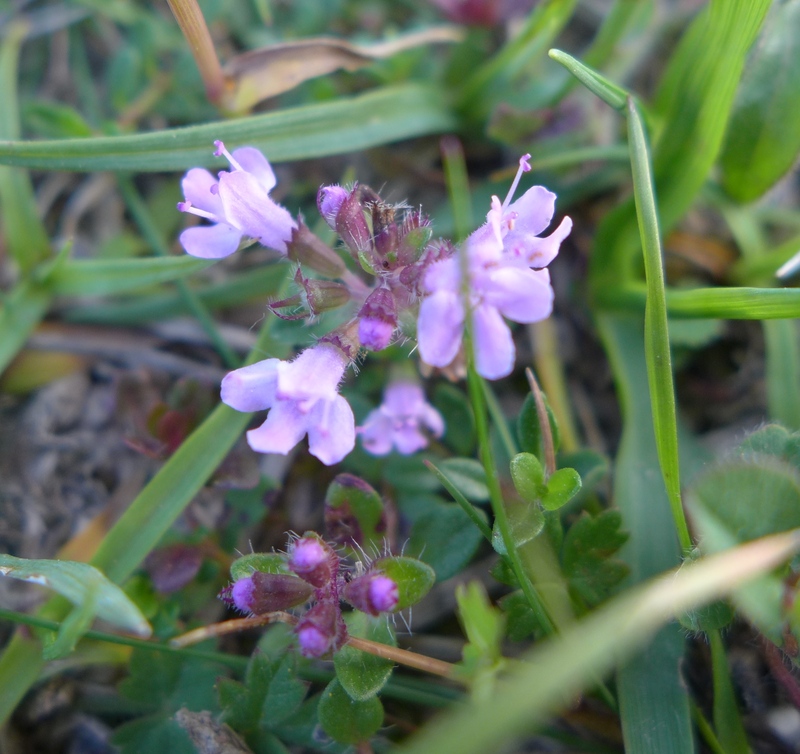 The other plant – you might have recognized the leaves – is a beloved and fragrant thyme species (Thymus polytrichus). 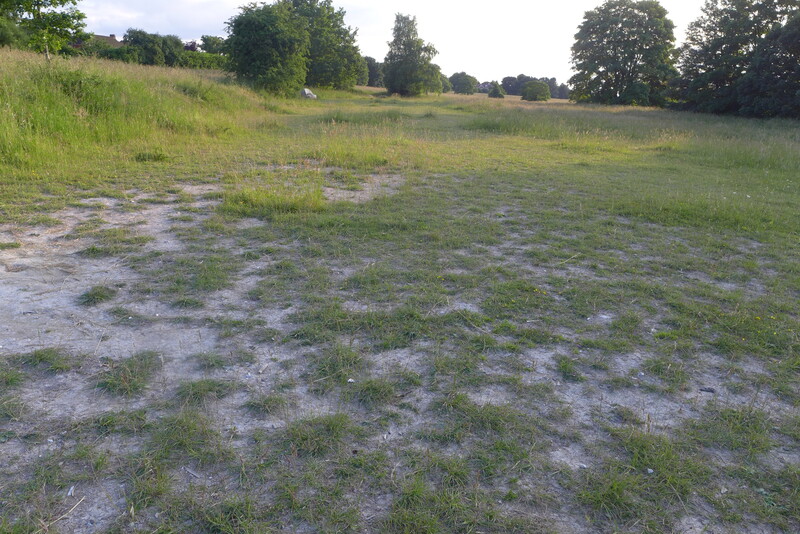 Chalk grassland is one of the richest habitats found in the UK, whether it is for plants or insects. I could probably write ten blog posts on a small patch of Merrow Downs reserve…don’t worry, I won’t, but I do hope this one gives you a good insight of the diversity that these grasslands harbor! Thanks for the introduction to the grasses. I think I see all of those in my neck of the woods without knowing what they are. Now I’ll be able to identify at least some of them. Are the seeds of the barren brome the ones that get stuck in your socks and prick your feet? 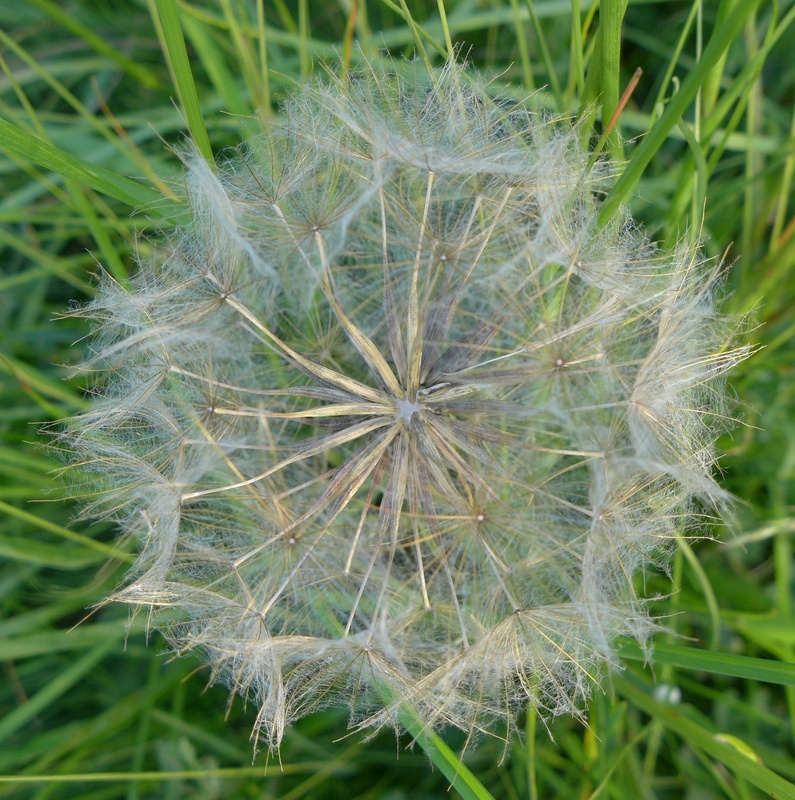 I know quite a few grasses which have “hitchhiking” seeds…efficient dispersal method! This is just a small sample of the most common grasses but I am glad they did ring a bell for you. Lovely blog Sophie, thank you. Merrow Downs also a favourite place of mine. I noticed that there are walks/talks on the Downs tomorrow – Sept 13th 11.00 – 3.00pm as part of the Guildford Heritage weekend. thought you might be interested,.